This badge was issued to DANIEL MOSCOVICI on 26 Sep 2016. 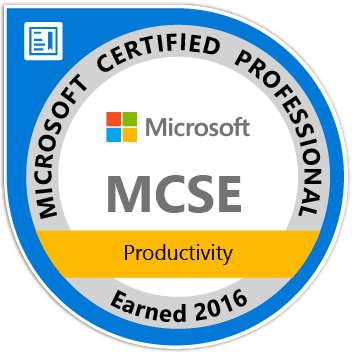 Earners of the MCSE: Productivity certification have demonstrated the skills required to move a company to the cloud, increase user productivity and flexibility, reduce data loss, and improve data security for an organization. Earning this certification qualifies an individual for a position in network and computer systems administration.